I must have lost my completely unverifiable Babe Ruth swinging technique (you'll just have to take my word for it) by sitting idle, writing phone reviews all day. But, as luck would have it, my smartphone can now teach me to swing for the fences for the first time... again. That's the idea behind new "Smart Bat" by wood bat maker Old Hickory and the sports sensor experts at Zepp. Its gyroscope and accelerometer-filled sensor syncs up to your phone or tablet to deliver 3D swing analysis and virtual coaching. The small disk-shaped sensor fastens into the barrel of the Old Hickory MT27 Smart Bat and wirelessly beams detailed metrics and 3D drawings to an iOS or Android app via Bluetooth. If this gadget sounds familiar, it's because Zepp also creates golf and tennis sensors. In fact, it uses the same Zepp 2 sensor that mounts to a golf glove, while a similar, but older Zep 1 sensor locks onto a tennis racket. Basically, Zepp is creating a IoT sports ecosystem. The Zepp baseball app provides more than a dozen swing insights including bat speed, max hand speed, attack angle, bat vertical angle, time of impact - the list goes on. There's an ability to record your swing and a feed showing kids achieving better numbers than I could ever pull off. But that's where the 10-part training plan comes into play. Your performance is also recorded with 3D swing illustrations that can be replayed from the bat path (profile view) and bat plane (overhead view). They look like the graphical swing-by-swing drawings that simulate baseball games when you can't afford the MLB.TV video subscriptions. Of course, all of this data doesn't come cheap. 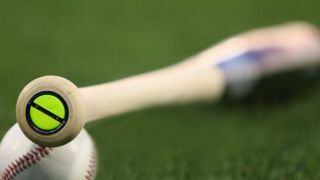 The Old Hickory MT27 Smart Bat costs $145 - the MT stands for Mike Trout of the Los Angeles of Anaheim Angels player outfielder, so this licensed bat was never going to come cheap anyway. The Zepp 2 Smart Sensor costs another $150. Thankfully, you can skip buying into the fancy wood bat and opt for the Bat Mount. At $15, it's clearly the more economical solution: bright green, made of plastic and handing off the end bottom of the bat barrel. The good news is that the mount enables the Zepp 2 to be used on your existing bat, including metal and softball bats. Is improving your bat swing worth that price? It really depends on whether or not you plan to (to use a baseball term) follow through. Then it's worth all of the peanuts and cracker (too much). Like a lot of health gadgets in the era of Fitbit Blaze, many people have the best of intentions and, after a month, put them down. As Homer Simpson once said to Bart after finding out that his son isn't interested in playing the expensive guitar he bought him: "I'm not mad. If something's hard to do, then it's not worth doing. You just stick that guitar in the garage next to your short-wave radio, your karate outfit, and your unicycle, and we'll go and watch TV." In other words, don't expect something like the neat-looking Zepp 2 to all of a sudden make you love playing baseball. The sensor will just end up in a drawer (or closet) somewhere with all of your other uncharged fitness trackers. However, if you're already swinging a bat and want to take your cut across the plate to the next level, this is the next-generation bat and gadget combo for you. It could make you the next Mike Trout - or at least the next person with a better-than-average swing who owns his fancy bat.